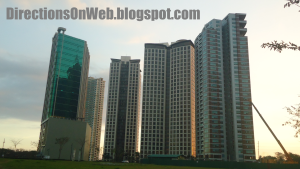 Bonifacio Global City is situated approx two kilometers to the east of MRT Ayala Station in EDSA, Makati. 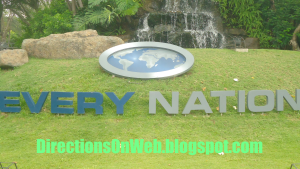 Boasts of world class destinations, Fort Bonifacio, as it is also known, can ultimately pass for hub of attractions when one asked where to go in Manila. 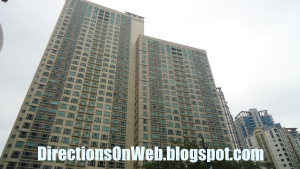 Now I'm going to give you direction to each and any of the buildings and destinations located inside Bonifacio Global City and it will be done the quickest possible time by means of links from the building names to the detailed guide on how to get to particular building or destination. The buildings' names and destinations' names are listed alphabetically. Kindly read until you get to the listing. 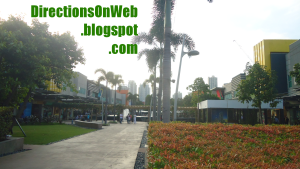 See embedded Bonifacio Global City map. Even if you're from the farthest part of Metro Manila, going to a location inside the Bonifacio Global City is relatively easy. First, you need to get to the exact location of MRT Ayala Station. You can get there either by bus or by train. Second, go down to northbound lane of EDSA which is the lane "opposite" SM Makati. There's only one stair there. Get inside BGC Bus Terminal and buy ticket, depending on what BGC bus route passes your destination. The buses take passengers to buildings and places located within the east part of BGC and then the bus parks at its other terminal in Market Market parking ground. All passengers who haven't alighted in Bus Stops at which the bus had stopped earlier must alight at Market Market. Get inside the terminal. Proceed to ticket seller window with signage that reads East. 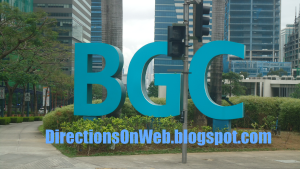 How to get to BGC Bus Terminal in EDSA from different locations? If you're in Glorietta or SM Makati, get across EDSA via MRT Ayala Station. If you're from any point along Ayala Avenue, take a "Washington-Ayala" jeepney to get to EDSA and use the pedestrian overpass to get to the BGC Bus Terminal. Some jeepneys cross EDSA, just ask driver. If you're riding a bus from north e.g. Caloocan, Cubao, Monumento, Fairview or Novaliches, alight at SM Makati and get across EDSA via MRT Station. If you're riding a bus from south e.g. Alabang, Sucat, Baclaran, NAIA, SM MOA or Pasay, alight at MRT Ayala Station. From any station of MRT-3, get off at Ayala Station. From any station of LRT-2, transfer at MRT-3 in Araneta Center Cubao Station. From a station of LRT-1, transfer to MRT-3 at Taft Station Important: The bus to ride in going to MRT Ayala Station/SM Makati must have a secondary sign that reads "Ayala Ibabaw." 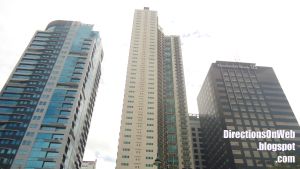 Below are the buildings and destinations inside BGC. First column is the name of buildings/destinations, second column is Bus Route for you to take, i.e. east and west, third column is name of Bus Stop nearest to the particular building or destination and fourth column is the Bus Stop Number (ordinal position) in relation to the The Fort Bus Terminal in EDSA. 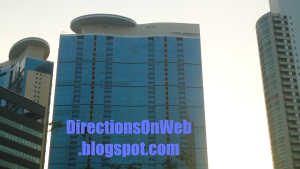 Just click your place to get direction. But first, go see the Route Map of each bus. So that you get bird's eye view of how the buses get around their respective routes. After you examine the maps, just click the Back button to get back here. For West Route Map, click here. For East Route Map, click here. For fast direction, just click the name of your building or place of destination. All buildings and spots are listed in alphabetical order. You will land to Bus Stop near it and with detailed map and walk guide from bus stop. Use Back button to return. Important: You're using mobile now. To maximize help that this guide gives, please make sure to drag maps by touching a map with TWO fingers and move to desired direction. Pinch to zoom out. 'Pinch-out' gesture to zoom in. Tip: Tap your thumb in each of red pins in the maps to show building names and quickly get directions. Important: Use TWO fingers to drag map from left to right to see the whole route. Pinch the map to zoom out. To zoom in, 'pinch-out' gesture. Tap each bus icon to get its name and to know which bus stop is available for boarding bus to return to EDSA. 5th Ave and McKinley Pkway intersection is the gateway to BGC from Ayala-EDSA and as such a BGC sign is erected at the left corner, welcoming visitors to Bonifacio Global City. The bus turns left onto 5th Ave from McKinley and then it will immediately stop after the left turn to drop passengers headed to the buildings near to this stop. If your destination is in this vicinity, alight here. As you can see in the map below, you can walk your way to American Cemetery via Rizal Drive. Please click red markers in the map to display building names. Regent Parkway, Essensa East Forbes and Fifth Avenue Place are along 5th Avenue toward south. But their entrances are situated facing 21st St, the road to the other side. 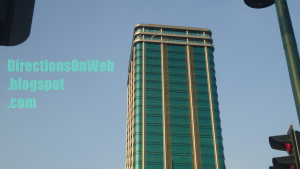 Jeco Prime Building is the colored green glass building that you see in front of Regent Parkway. 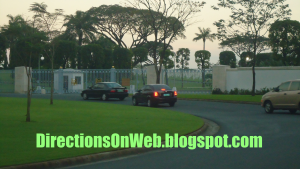 Singapore Embassy is the large fenced compound located few meters from the bus stop. Fairway Tower is at the other corner of 5th Ave and McKinley. 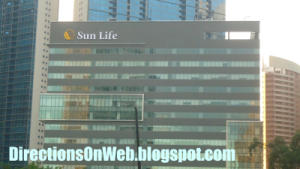 Sun Life Centre is very visible from this bus stop as its signage is facing your direction. 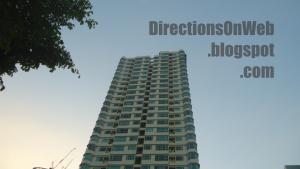 Pacific Plaza Towers is a short walk away from Fairway Tower via 23rd St, the short road opposite Embassy of Singapore. Just take 4th Ave from small roundabout. Next to Fairway Tower is The Beaufort followed by Victoria Fort. To get to Seibu Tower, walk along 5th Ave, turn right onto 24th St. Icon Plaza Showroom is at the right of 5th Ave opposite Sun Life Centre. 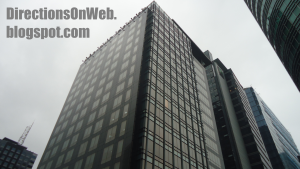 Next to it is One Global Place, situated at 5th Ave corner 25th St. Location Map of buildings around McKinley Pkway Bus Stop. Click red pins for building names. This bus stop is popularly known as The Fort Station. From 5th Ave, BGC bus turns right onto 25th St and turns left onto 7th Ave. Then it turns left again onto 26th St where it will stop at this bus stop which is located before the intersection of 5th Ave. Uptown Mall is one more BGC bus ride away. Alight here, buy ticket from ticket seller (in uniform) and wait for BGC bus with "North" sign. Tell the driver you're getting off at Uptown Mall. 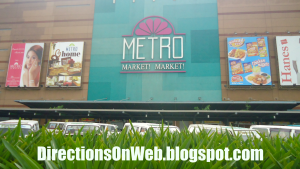 For one jeepney ride to Uptown Mall from either MRT or SLEX, go to How to Commute to Uptown Mall BGC Taguig. St Michael the Archangel Parish Church is one more ride from this stop. For more details, go to How to Get to St Michael the Archangel Parish in BGC. Ascott, far right along 5th Ave, is easily seen from this stop with its name on its upper facade. But it is nearer to Net One, please read the guide there. 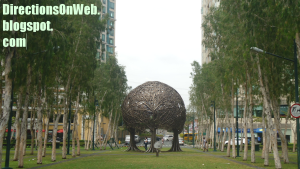 Net Park is next to Net Lima aka Philamlife, along 5th Ave. But it will be more convenient if you use the next bus stop as it will only be a stone throw away. 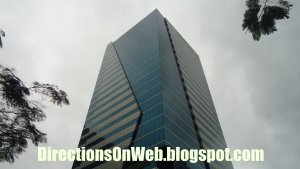 Opposite this bus stop across 26th St is RCBC Savings Corporate Tower. 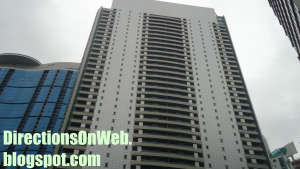 Next to RCBC toward 7th Ave is Icon Plaza. Located adjacent to the parking area by the bus stop is The Fort. The Maybank Performing Arts Theater is located at the corner of 26th Street and 9th Ave. From this bus stop, walk back along 26th St past 7th St and you will immediately see the signage of the arts theater on its facade, right hand side of 26th St. BGC Arts Center is the entire complex in which the Maybank Performing Arts Theater is founded. Sun Life Amphitheater - you would have seen it to your right after the bus turned left onto 7th Ave from 25th St. Sun Life Amphitheater is located at the same location of Maybank Performing Arts, only much nearer, so you'll pass by it on the way to Maybank Performing Arts. Where is BHS Amphitheater? If you're going to Bonifacio High Street Amphitheater and Central Square, walk to 5th Ave, turn right there and walk past the next intersection of 28th St. Turn right onto High Street for the Amphitheater. Central Square is the building to your left. If your destination is the NBC Tent which is located at the other side of 7th Ave, walk back until you get to the corner of 26th and 7th Ave where you will immediately see NBC Tent at the other opposite corner. Forum South Global is located along the bus route in 7th Ave, you should have seen it if you're on the right side of the bus. To get there, turn right onto 7th Ave from 26th St The Fort Bus Stop, you will immediately see McDonald's branch in Forum South Global. 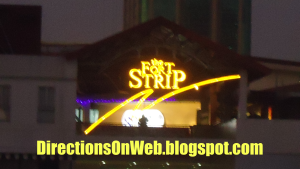 The Fort Strip is almost opposite NBC Tent, just walk further a bit. One Parkade is located at the corner of 7th Ave and 30th St. Just walk past NBC Tent and The Fort Strip and you will immediately see the signage of OneParkade. 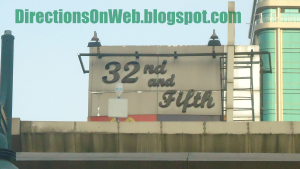 Meanwhile, Philam Life which occupies Net Lima bldg is located across 5th Ave exactly at the other corner of 26th St and you will immediately see it from the bus stop because there's a signage of Philam Life. 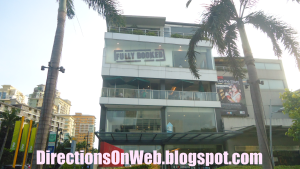 Mini Cooper is situated at the other corner of 26th St and 5th Ave opposite Philam Life. Location map around RCBC bus stop. Click each red pin to read the name. After taking 26th St, the bus crosses 5th Ave, drives past 4th Ave, turns right onto 3rd Ave and stops immediately after passing by the building of Net One Center which is located at the corner of 26th St and 3rd Ave. This bus stop is near corner of 27th St, a very short inner road. How to get to The Mind Museum? Walk straight along 3rd Ave and cross 28th Street. The Mind Museum is on the left of 3rd Ave past 28th St. The back lobby entrance of Net Park is a stone throw away here. Just walk along 27th St and in less than 3 minutes, you'll get there. 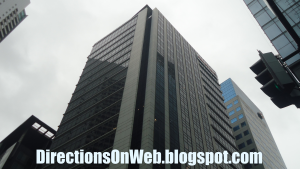 Ascott is immediately next to Net Park along 4th Ave. The hotel is at the corner of 4th Ave 28th St. Note: Even though official addresses are 5th Ave, lobby entrances of Net Park and Ascott are located at 4th Ave. If your destination is Net One Center, just walk back a little bit. You can easily see McDonald's at Forbes Town, just walk across 3rd Ave and Rizal Dr. McDonald's is opposite Net One Center. As you can see in the map below (click red pins), One McKinley Place is just across 26th St. Marajo Tower is located next to Net One bldg along 26th St, so you need to walk back toward 5th Ave along 26th St to get there. Marajo Tower is actually located at the corner of 4th Ave and 26th St. Seattle Best Coffee is opposite Marajo Tower at the other corner of 4th Ave across 26th St. Autohub is at the other corner of 26th St across 4th Ave. If your destination is Picadilly Star walk from bust stop forward along 3rd Ave and turn right onto 27th St. Picadilly Star is situated at the corner of 27th St and 4th Ave. 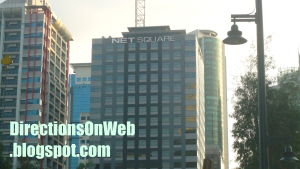 Walk past 27th St to get to 28 St where Net Square - Ericsson is located at the corner. 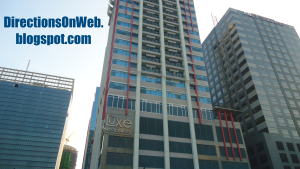 Turn right onto 28th St to get to Luxe Residences which is next to Net Square. Turn left onto 28th St to get to Forbes Woods Heights. 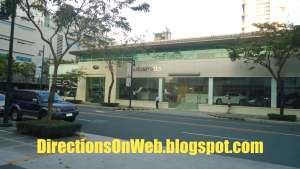 How to commute to Forbes Town Center from EDSA? Alight from the BGC Bus at this bus stop. Walk across 3rd Ave toward McDonald's Forbes Town which is very visible from this bus stop. It's just a short walk away. 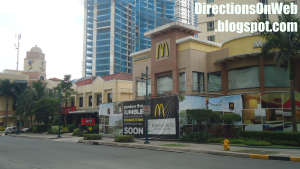 McDonald's Forbes Town is exactly located at the corner of 26 St and Rizal Dr. Walk a little bit from the corner of 26th St and Rizal Dr along 26th St until you get to Forbestown Road which is already the Forbes Town Center. Forbestown Road also leads to the Burgos Circle. 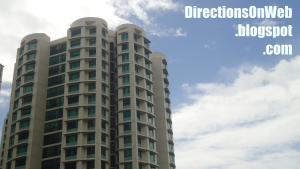 Along Rizal Dr, next to McDonald's Forbes Town toward 28th St is Forbeswood Parklane, followed by Forbeswood Heights. Entrances of Icon Residences and Avant The Fort are located at small roundabout at the end of 3rd Ave past Net One Center and One McKinley Place. See photos of these buildings below this map. Location Map around NetOne Bus Stop. Click red pins to read building names. Bonifacio Stopover Bus Stop is located in front of the building of Bonifacio Stopover Pavilion, hence, the eponym. From Net One which is the third bus stop from EDSA, the bus takes the one way 3rd Ave all the way past The Mind Museum and then it will take the turnaround road to take Rizal Drive, which goes in the opposite direction. The bus will turn right immediately onto the first T-intersection which is 31st St cor Rizal Drive where Bonifacio Stopover Pavilion is situated. The bus stops right there in that station. 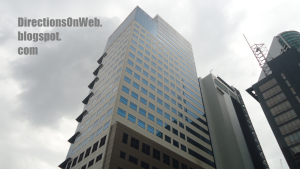 Bonifacio One Technology Tower is just across Bonifacio Stopover. 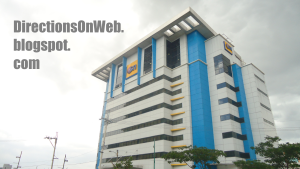 It is located at the opposite corner of Rizal Dr and 31st St. Just cross 31st St if that is your destination. 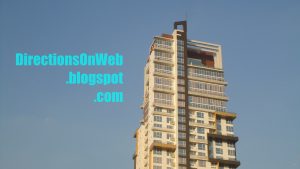 Bench Tower is next to Bonifacio One Technology along Rizal Dr. If your destination is Furnitalia/Space 2000, Walk along Rizal Dr from Bonifacio One Technology past Bench Tower and cross the next street which is 30th St. Furnitalia is at the opposite corner of Rizal Dr and 30th St across Bench Tower. 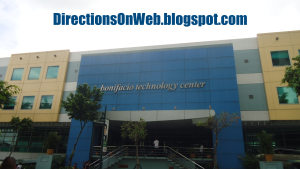 Bonifacio Stopover Corporate Center is the tall building attached to Bonifacio Stopover Pavilion along 31st St. Just walk along 31st St toward the direction of the bus. If your destination is any of the following: CATS Motors Inc's Mercedes Benz, St Luke Medical Center, Ford Global City, Korean Cultural Center, Mancor Corporate Center, Meguiar's VIP Auto Salon, Kia Motors Global City and Karport, walk back to Rizal Dr from bus stop. Walk along Rizal drive from Bonifacio Stopover Pavilion past the turnaround road that bus has taken. 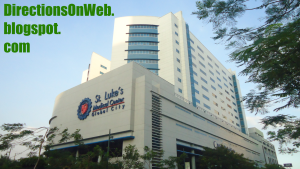 Cross the main intersection of Rizal Dr and 32nd St. CATS Mercedes Benz and St Luke Medical Center are located at opposite corners of 32nd St and Rizal Dr, respectively. You'll see them immediately. Ford Global is next to Mercedes Benz along Rizal Dr. Next to Mercedes Benz along 32nd St are: Korean Cultural Center, Mancor Corporate Center, Meguiar's VIP Auto Salon, Kia Motors Global City and Karport, in that order. Stand-alone restaurants of Chowking, Red Ribbon and Jollibee are located in that tip of Rizal Dr before the intersection of 32nd St. If your destination is any of these buildings: The Curve, Fort Legend Tower, McKinley Park Residences, Net Cube, Shangri-la at the Fort Manila, Commerce Center and Net Quad, then you have to get back to 3rd Ave. Walk across the parking lot between Rizal Dr and 3rd Ave. If you're standing at the corner of 31st and Rizal Dr, looking at the tall buildings of 3rd Ave, from left to right are: The Curve (exactly located at the corner of 32nd St and 3rd Ave), Fort Legend Tower, MdKinley Park Residences, Net Cube and the super tall skyscraper is Shangri-La. Those buildings are each located in corners, and their names are all visible. Meanwhile, Commerce Center is at the back of Fort Legend while Net Quad is at the back of McKinley Park and Net Cube from your location, of course. Location Map of buildings around Bonifacio Stopover. Click red pins for building names. Important: Please drag the map to all directions to see all pins of all buildings. As you can see in the map, the bus takes Rizal Drive from 3rd Ave via turaround lane. Then it turns right onto the next street perpendicular to Rizal Drive which is 31st St. The bus crosses 2nd Ave and turns left onto 1st Ave where the fifth Bus Stop from EDSA is located. Both Upper Route - rush hour and West Route - off-peak hour take the same direction. 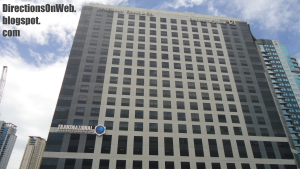 If your destination is JP Morgan Chase which is located at Net Plaza bldg, walk back to 31st St, turn left onto 31st St and you will immediately see the building from afar, right side of 31st St. Bonifacio Technology Centre is just opposite 1st Ave along 31st St. It's the elongated building that stretches from the corner of 2nd Ave to the next building which is the Net Plaza itself. Burgos Circle is located at the other end of 1st Ave which bends to left. Just walk down the road (1st Ave) until you get to its opposite end. 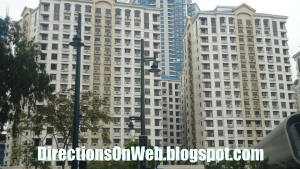 Bellagio is also located there at the corner of 1st Ave and Burgos Circle roundabout. 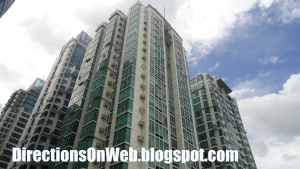 The Grand Hamptons Tower 2 is just opposite the Bus Stop. It is located at the corner of 1st Ave and 31st St. Just cross the road to get there. 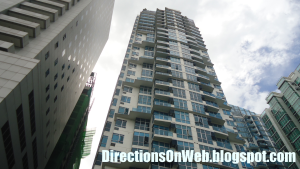 Turn right onto 31st St to get to The Grand Hamptons Tower 1 which is next to The Grand Hamptons Tower 2 along 31st St. Cross 2nd Ave to ge to The Sapphire Residences which is at the corner of 2nd Ave and 31st St. Fort Palm Spring Condominium is next to The Grand Hamptons Tower 2 along 1st Ave. It is located at the corner of 30th St. Penhurst Park Place is at the other corner of 1st Ave and 30th St. Next to Penhurst Park Place along 1st Ave is Kensington Place. Still, along 1st Ave opposite Kensington Place is Bonifacio Ridge which is to the right of side of 1st Ave if you're walking from the Bus Stop which is also at the right side of 1st Ave. Turn left onto 30th St if you're going to Crescent Park Residences which is next to Penhurst Park Place. 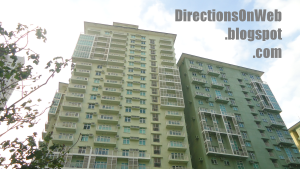 Blue Sapphire Residences is next to Fort Palm Spring Condominium. Blue Sapphire is at the left corner of 30th St and 2nd Ave. Lastly, cross 2nd Ave to get to Accralaw and The Fort Residences which are located at the left and right corners of 2nd Ave and 30th St, respectively. Location map: Buildings near Crescent Park bus stop. 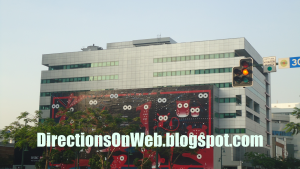 Click red pins to get building names. This is the last Bus Stop before the bus goes back to EDSA terminal. Most passengers who are coming to the buildings near to this bus stop alight at the first bus stop in McKinley Parkway. It's faster to reach destinations here from McKinley Parkway Bus Stop than spending time inside the bus and wait till it reaches this Bus Stop. 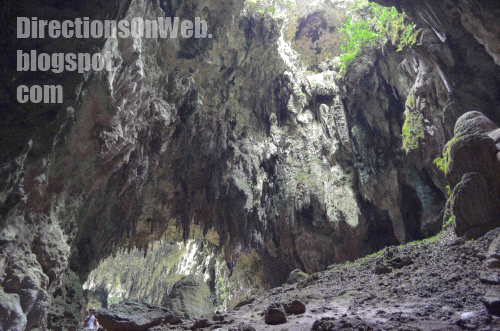 Nevertheless, there are few who preferred to alight here. 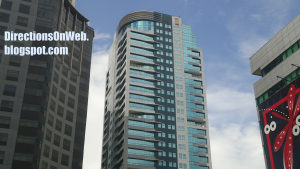 The buildings around it are: Sun Life Centre, Pacific Plaza Towers, Icon Plaza Showroom, One Global Place, The Beaufort, Seibu Tower, Singapore Embassy and Fort Victoria in which this Bus Stop is located. Please see map below to know "walk direction" to any of the buildings from this Bus Stop. Location Map of buildings around Fort Victoria Bus Stop. Click red pins for names. IMPORTANT: Please click each red bus icon to see bus stop name and if you can use it to return to EDSA. Not all bus stops are available for boarding a bus back to MRT Ayala Station/BGC Terminal EDSA. Important: Please tap each red bus icon to see bus stop name and see if you can use it to return to EDSA. Not all bus stops are available for boarding a bus back to MRT Ayala/BGC EDSA Terminal. The difference between BGC Bus East Route and HM Bus East Route aside from the roads they take from EDSA is that the former stops at McKinley Pkway Bus Stop before heading to The Fort Bus Stop which is the first Bus Stop of HM Bus. So, you must remember this: If the bus you take East Route is HM Bus, it will not pass by Mckinley Pkway. It's first Bus Stop from EDSA is The Fort. If the bus you take East Route is BGC Bus, it will stop in McKinley Pkway Bus Stop if there are passengers alighting there. 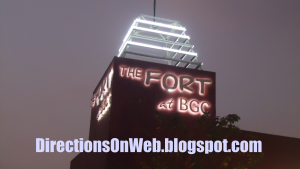 And the second Bus Stop of BGC Bus is The Fort. 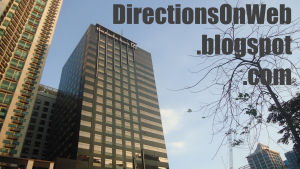 Directions explain below is based on HM Bus routes and bus stops. Located along 7th Ave immediately after the bus turns right from 32nd St. This is where to get off the bus if your destination is Globe Tower which the bus has passed by at the corner of 32nd St and 7th Ave. Walk back to 32nd St, turn left to get to the entrance. W City Center is right at this bus stop, you will quickly see it. Because this bus stop is exactly located at the frontage of W City Center. The Trade and Financial Tower is located at the other corner of 32nd and 7th Ave. F1 City Center Hotel is next to Globe Tower. W Fifth Ave is along 5th Ave, just turn left from 32nd. HSBC Centre is just across W Fift Ave. Walk across 32 Street to get to S&R Membership Shopping which is at the other corner of 32nd St and 5th Ave. MC Home Depot is along 32 Street next to S&R. Cross 32nd from the corner of 5th Ave to get to 32nd & Fifth which is very visible from the bus stop. Autostrade and LR Phils are next to 32nd & Fifth, exactly located at the corner of 32nd and 4th Ave. See map below. Location Map of buildings around MC Bus Stop. Click red pins to read building names. Located along 30th St few meters before the main intersection of 9th Ave. Exactly at that corner of 9th Ave and 30th St is a under construction building. Opposite that building, located at the other corner or the opposite corner of 9th Ave and 30th St is W Global Center building. To get to Seda building, walk from bus stop, cross 9th Ave, walk further along 30th St until you see the building with the word "Seda" above it. It is located at the end tip of 30th St. 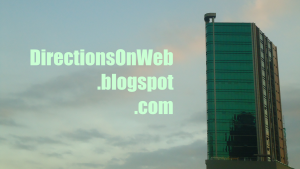 If your destination is either ECO Tower or NAC Tower, here's what to do. From bus stop, walk forward to 9th Ave and turn left on 9th Ave. Walk along 9th Ave which is northward past 31st St until you get to the main intersection of 32nd St where the ECO Tower is situated. Turn left on 32nd St to get to NAC Tower which is next to ECO Tower. If your destination is either One World Place or Citibank Plaza aka Citi Plaza, cross 32nd St. You must see by now the logo of Citi Plaza up ahead. To get to Citi Plaza, walk further along 9th Ave past Lane R and Lane S and turn right onto the next intersection which is 34th St, walk until you get to the exact location of the Citi Plaza. To get to One World Place, walk along 32nd St, turn right on 32nd St from 9th Ave after you cross 32nd. Walk further and you'll see the tall building in the middle of 9th Ave and 11th Ave.
From bus stop, walk to 9th Ave. Turn right onto 9th Ave. Walk along 9th Ave from 30th St to get to High Street. Nuffnang Philippines is along 9th Ave, at the corner of Lane P and 9th Ave in Bonifacio High Street. Agave is located at the same building where Nuffnang is. To get to Slice, walk past Agave until you get to the corner of High Street where Nike is located, turn right. Walk past Seattle's Best Coffee, IStudio, Nokia, The Stock Market, Geox, Runnr, Speedo and Starbucks Coffee. Walk across the road (7th Ave) towards C2 Building (visible from Starbucks) which is to your left. Slice is at the ground floor of C2 Building alongside Mango and Jamba Juice. For fast commute directions to different establishments in High Street, go to Commute Fast To Restaurants & Establishments In Bonifacio High Street. Dimension is to the left of 9th Ave in High Street. Brothers Burger is also located near 9th Ave. Walk past High Street and to your right is Bo Concept, then MOs Design and Active Fun Children's Play and Party Center to the right of 9th Ave corner of 28th St. Opposite Active Fun, to the left corner is Honda Cars Global City. Now walk along 28th St from Honda eastward and you will get to PGA Cars Audi, located at the corner of 28th and 11th Ave which is W Office Building. If your destination is MUJI or Fully Booked, then, from Nuffnang, walk inside Bonifacio High Street eastward until you get to 11th Ave where they are located opposite each other. GAP is at the same building of MUJI. Buildings and spots near 30th Street Bus Stop. Click red pins to get their names. Note: Please move the map downward to see pins of Citibank Plaza, One World Place, Eco Tower, etc. Located right before C-5 and Metro Market Market where terminal of jeepneys and FXs bound for different directions is located. The tall building of STI is just across 32nd St, situated at the corner of 32nd and 38th St. Kidzania Manila is located past STI building, walk past STI, turn right at that corner, 34th St, and the building next to open space at left is the Kidzania. The frontage is at the other street that bordered it, 11th Ave. From STI building cross 34th St and turn right onto the next street which is 11th Ave, immediately you will see the big signage of Kidzania at the right of 11th Ave, next to vacant space of 11th Ave cor 32nd St. Also visible even before the bus stops is Every Nation, located at the right corner of 32nd and 38 streets opposite STI. You just cross 32nd to get to them. 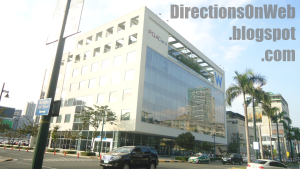 Walk to the right of 38th Street from Every Nation to get to International School Manila which is next to Every Nation. Walk to the left of 38th St from STI to get to Energy Development Corporation and Department of Energy which are next to STI. PNOC is next. Then British School Manila followed by Manila Japanese School which you might find too far for a walk, so you might consider taking a taxi from Market Market. But you can actually ride a jeepney that passes through 38th St. The sign of the jeepney is "Guadalupe" and you can ride this jeep at the loading area along McKinley Pkwy between Market Market and Serendra. 38th St continues McKinley Pkway to the other side of 32nd St. Location map of buildings around STI Bus Stop. Click red pins to read building names. Located at the front of Market Market. The bus just gets around the mall and stops at its terminal located at 26th St. SM Aura Premier is located just across 26th St. To get there, use the pedestrian crossing nearby. See map below. 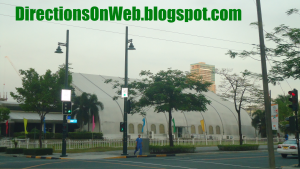 Bonifacio Civic Center is the tall building attached to SM Aura. 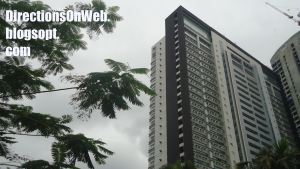 If you're destination is South of Market and Serendra, then walk along 26th Street westward. The tall twin tower building you see to the left up ahead is South of Market. Entrances of Serendra are situated along 11th Ave. Most of the passengers bound for Market Market and SM Aura alight at this Bus Terminal which also known as BGC Central. holy mother! kumpleto ah! kampay! Hello sir, thank you ha. Ilang araw din nasa draft yan bago ko na-published eh. Salamat sa pag-suri hehe. Wow. I'm dumbfounded. This should be made to a Directions Guide to BGC Map booklet and provided to any local or foreign tourist. Calling the attention of INTELLECTUALLY savvy Taguig City Town managers---This is the perfect guide to YOUR TAX RICH CITY PROPERTY. I can't say enough but again kudos to the blogger for the detailed and meticulously crafted directional guide to BONIFACIO GLOBAL CITY. Thank you so much, sir Amado. Your nice words inspire me to publish more directions in this level. Marami po salamat. Holy Moly! Pwede ka nang gumawa ng book para may bayad!!!! Publish na yan, libre lang kasi sa blog eh. The scope is extensive. Ikaw na! Magandang ideya. Pero wala akong knowledge sa ganyan e. Gusto mo ikaw ang mag-publish ng book then hati tyo sa royalty... Ganun ba yun? Hehe! Yay! Wala rin akong alam, pero wait, itweet ko siya at i-share sa mga twitter and Fb followers ko na mangilan-ngilan baka may publisher sa kanila. HAha. This was indeed a breather for those planning to work or simply visit the place..Mind you I had to learn my directions the hard way last year plying to this unknown route. Since majority of the marathons have been organized @BGC being familiar with the directions is a must.. This would really be a handy dandy. Thanks a lot. I'm amazed how you perfectly laid out the directions. Really helpful! @ VanityOrNot Pre-order Shop. First, ride a jeepney bound for "Gate 3". Alight at Market Market The Fort Bus Terminal. Ride "The Fort Bus" and ask the driver to drop you off at "Net Cube" bus stop. 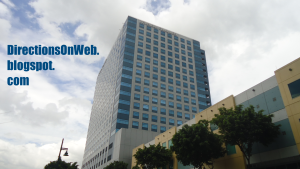 Net Quad is the building at the back of Net Cube. what route then, shall i take if i'm going to upper mckinley hill (the venice piazza) ? @ our group. Sir/Madam, can you please tell where you will be coming from? So that I ca give you accurate info. Are you driving? This is very very useful! Thank you so much! Now I'm more confident in commuting to my BGC destination! @ grace. You are welcome. You might like to "plus 1" me on Google+. I will be very thankful. Just click the Google Plus button below the title of this post. Thanks. How to commute coming from Buendia going to the Fort? Is there a jeep on Buendia that goes to the Fort? @ Moët♥. You did not specify the exact spot in Buendia, it's very long. So I will now assume you are near Taft of Buendia. From there take bus bound for Cubao with "Ayala" on its sign. You must alight at unloading area in Glorietta, then walk towards EDSA and cross to the other side. You can now go to The Fort Bus Terminal in EDSA and take the appropriate bus to get to The Fort. Please read my article above as I mentioned clearly the right Bus Stop to get off the bus which is adjacent to The Fort. Hope my directions helps you. Cheers. Thanks. I heard there's an Ayala-Fort jeep at the Osmena Hiway x Buendia intersection that passes over Kalayaan and passes by Market Market, is there such a thing? Also I was told there's an Ayala-Washington jeep that they say passes through Buendia then Ayala and will take you across EDSA to the Fort Bus terminal, is there such a thing, too? @ Moët♥. Yes there are jeepneys from Buendia corner Washington that go across EDSA and some of them pass by The Fort Bus Terminal. Take note that these jeeps have "Ayala-Washington" wordings on their both sides. You can take one of these jeepneys as well if you are in that vicinity. With regards to your first question, I will go check it. Hi I'm a bit lost :) I don't know which bus stop is closest to the Maybank Corporate Center. The address is 7th Avenue corner 30th Street, hope you can help me out.. thanks! Hi, hope you can help me out :) I don't know which bus stop is closest to Maybank Corporate Center, the address is 7th Ave corner 30th Street. Thanks! @ Lei Madarang. Hello, the nearest Bus Stop to your destination is either "High Street 30th St" or "32nd St MC Depot". From there walk towards the corner of 7th Ave and 30th St. Just follow the road signs and you will not get lost. Hope my direction helps you. @ Angelo Casiding. If you want to get there quickly, the first bus stop is better. Just walk a little bit along 5th Ave towards 23rd St which is the exact location of your destination. Hope this direction helps you. Hi, is there any jeepneys from mckinley pkway to stopover 31st street? my route is from Two world square mckinly hill to Jp morgan.. hope you could help me..
@ Ana Roces. Hello, Ana. Just walk back to the corner of Rizal Drive and cross towards the opposite corner where Jollibee is situated. Walk along Rizal Dr until you get to the corner of 31st St, there's a Chowking there. Turn right and you will see the nearest Fort Bus Stop which is "31st St Stop Over". Fall in line under the sign that reads "Ayala MRT" because the other queue is for Bus bound for "Market Market". That's the nearest bus stop you can take to get back to MRT Ayala Station. Hope my direction helps you. Thank you very much for these very detailed directions! Super helpful. I've been using this to get to my meetings in BGC! This is very useful and comprehensive. My question is, how do I get back to MRT Ayala from Bonifacio Global City? Last time I was there, I had to take two bus rides (which means double the fare)--I got off at Market Market then got on a BGC bus going to Ayala. @ Aviva. Hello po. I think you have ridden a wrong bus. If you are in either Net Cube Bus Stop or 31st St Bus Stop, please remember that two bus routes use them. One is the bus bound for Market Market and with sign that reads "BGC Central" or "Market Market". The other one is bound for MRT Ayala EDSA with sign that reads "WEST" or "McKinley Stopover" or "MRT Ayala". Please don't use 30th St High St Bus Stop as it only serves bus bound for Market Market. If you can give me your location, I will be very happy to assist you by giving you right direction to the nearest bus stop where you can ride a bus that goes directly to EDSA/MRT Ayala. 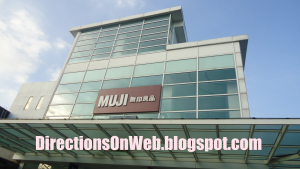 Let's say I'm in Muji High Street, how do I get back to MRT Ayala? @ Aviva. Walk towards 9th Ave. Turn left on 9th Ave. Turn right on 28th St. Wait for a bus at BGC Bus Stop located along 28th St between 9th Ave and 7th Ave. Make sure its headed to MRT Ayala by asking the driver. You can ride any of these buses: BGC Bus, HM Bus or Worthy Bus. Hope my direction helps you. @ Dave Cortiguerra. Hindi po, kung hindi ako nagkakamali hanggang 10pm lang. Wala po anuman. Hi Lag alag thank you so much for the directions. Can I ask you to do an update and give permission for me to use your materials on this topic on my site? I am willing to pay a fee. I only added spaces between them on this reply because comments interpreted the codes in another way. I need to illustrate to you html coding to be used so I need to put the spaces. At your end, please don't use spaces otherwise errors will occur. If you have more questions or help regarding this, just let me know. Thanks. Another thing: This is much better because if I update this post which I must considering the changes in bus routes that I came to learn, you don't need to worry about updating your own topic. As you we are linked. This is the ethically acceptable way of using other articles from other authors. Thanks again. Great blog! Very helpful for a first time commuter like me :) Could I also ask for some assistance? If I'm coming from Upper Mckinley Hill, I know there's a jeep that can bring me back to BGC, what Bus stop would you recommend I walk to/be dropped off at so I can ride the Bus going back to Ayala MRT? Appreciate your help! Thank you very much! @ kriskadph. Thanks for the appreciation. 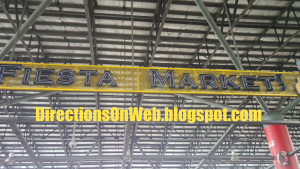 The best bus stop to alight from the jeepney that will be coming from Upper McKinley is the Market Market Terminal itself. 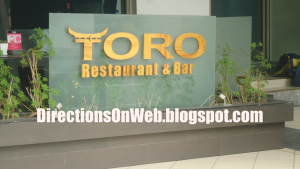 It is located between Market Market mall and SM Aura. Ride the bus bound for EDSA Ayala there, just make sure to ask the driver if he is indeed headed to EDSA because there are two routes of buses there. Hope this direction helps you. @ Andhie Garcia. If you're riding "Masinag-Ayala via C-5" vehicle, alight at Market Market, ride a BGC bus with "Central" sign and alight at "Net One". It will be announced by the driver. @ Tef. Salamat din sa iyong aprobal. Yes, I will. Hi! Can you help me? I would like to know the best route to take from 7th Avenue going back to Ayala MRT/Shell. @ Novembershowers. Just go to the nearest bus stop there, you won't miss it. Then take the bus with "West Route" sign. It's headed back to its terminal in EDSA/MRT-Ayala. @ Novembershowers. You are welcome. 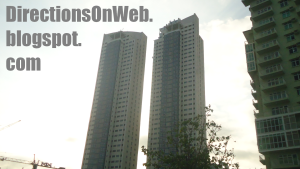 Well this is an off-topic question but still it's within Taguig. 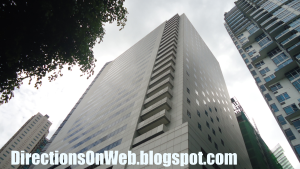 Do you know how to get to One World Square Bldg. in Upper McKinley Road from Eastwood Ave in Quezon City ( or within the C-5 area). Many thanks. @ SHENY. Jeepney to Cubao, MRT to Ayala, BGC bus to Market Market, "Gate 3" jeepney to your destination. Alternative: "Gate 3" jeepney from Guadalupe..
@ C Garcia. Take an East Route BGC bus and alight at STI 32nd St bus stop, Walk back to McKinley Pkway street and take a jeepney bound for "Guadalupe" there. Ask driver to drop you off to 39th St.
@ Giovenna Bianca. You can use the bus stop located along 1st Ave near cor 31st St. The bus must be headed to MRT/EDSA. how to get to picadilly star building? pag hindi rush hour. and how to go back to edsa ayala? thanks. Thanks for the swift response! Oh, another thing, how can i go back to Edsa-Ayala from Picadilly star building? 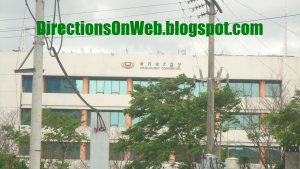 Will I go back to Net One bus stop and wait for a west route sign? Sorry, just a first time commuter in bcg. Many thanks and God Bless! @ Rose Ann Velasco. Yes. Wait for the same bus (West Route) and on the same lane because the bus gets around the West part of BGC continuously until it reaches EDSA/McKinley terminal again. Take the same bus at the same bus stop. Just wait for the bus to arrive. Hi. 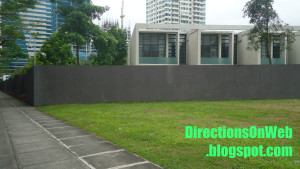 I'm planning to go to Net Cube Center E-Square Crescent Park West from Cainta Rizal. I will be riding a UV Express with a sign of Ayala C-5. this goes in ortigas ext then C-5 then kalayaan ave. I would like to know where i could get off and ride a BGC bus going to Net Cube Center. I've never been to BGC. Thanks. my travel would be around 8am-11am. You can alight at Kalayaan/32nd St, walk along 32nd all the way to 3rd Ave, make right, walk along 3rd Ave until you get to Net Cube (left side) or alight at Ayala terminal and take the BGC bus to Net Cube. Hi! I am from taft going to S&R. I was wondering if I could take the ayala bus from buendia and drop off at glorietta (i'm not sure if they drop off passengers there) to go to the bus station. Is this right? If so, how many hours would it take me considering my work starts at rush hours. Thanks! Yes, you can get off the bus at Glorietta and walk your way to BGC bus terminal via EDSA/Ayala pedestrian overpass. I can't give estimate as to how long it would take you to get to S&R. Thanks for appreciation. You only need to get back to the bus stop where you got off. Wait for a BGC bus with WEST ROUTE sign. It goes back to EDSA Terminal/MRT Ayala Station. I can't seem to find how to get to TwentyFour Seven McKinley, 24th st. corner 7th ave., bgc? May I have a permission to post This Site! Hi I'am Christine from Berkwil Construction Inc. I'm here to propose about The Berkwil Construction Inc. In Berkwil Construction Inc. We have a Contractor , Interior Designer, Construction Service & Supply. Hi Sir! How can I get to 38th North (Everest Academy Manila) from Alabang? Thank you in advance. Complete address is needed, thanks. Hi I would like to ask if this is still updated? or it does not need any update because BGC commute route did not change? This is regularly updated. Last update - 22 June 17. To see all updates done, please go to our Updates page. Thank you. Wait for the same BGC bus at the same bus stop you would have alighted. Make sure you have ticket. There's ticket seller in the area. Direction to JP Morgan Chase is clearly written in the post. Hi! Sorry I don't know where to post this question. 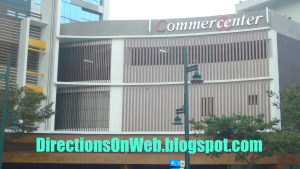 I'm planning to got to Five E-Com Center in MOA complex by commute. However, I'm not familiar with the area. I'm coming from Alabang. Wish you could help me on this one. TIA! We have separate post on how to get to MOA. I keep on updating this guide. Last update - June 22, '17. I will try to include that spot on next update.